This video shows a rare moment of quiet on the machine gun range. Christophe, the VP for Sales and Marketing from Kriss, explained that the silencer on the Vector is not “hearing safe” when shot dry. They are currently working on one that is. But let’s face it. This one is quiet enough that you could use it to defend yourself during a home invasion without permanently deafening yourself. This gun is the perfect example of why the NFA is such a stupid law. Because the barrel is less than 16 inches, this is a “Short Barreled Rifle.” Not a “Pistol with a Stock On It.” Then, the cool little hearing protection device on the front is just as carefully controlled as a full blown machine gun! They ought to hand them out as free gifts at shooting ranges. I’ll pay the $200 each for the NFA tax stamps, but I don’t have to like it. 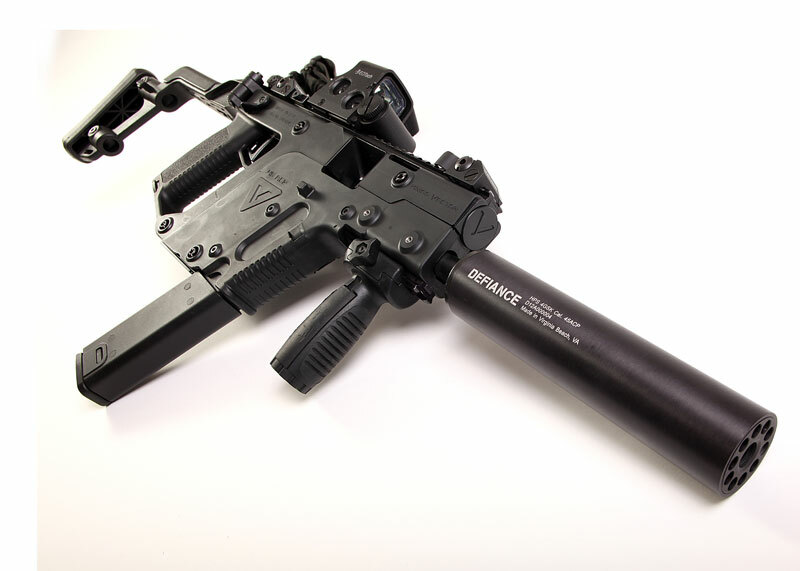 So Sean, we know you can’t buy the Kriss Vector with full auto capability, but what is it like to shoot? It looks like I’m having trouble controlling it, but I am not. That last burst was me tracking a 5lb propane bottle as the bullets drive it downrange. You can see by my reaction how much fun it is to shoot. This is a video of me the first time I ever picked up the Kriss Vector. You can see that I spend a bit of time trying to decide where to hold the rifle. I finally decide that the best place to hold it is on the sloped front end rather than the attached vertical foregrip. You can’t reach the bolt catch/charging handle from the foregrip. If you listen closely, you will hear Reuven calling targets for me. “Go for double tap” he says. All you friends and family sweating over what to give me for Christmas? Well, there is this really cool gun I want. I’m just saying. You can hear Reuven coaching me. He was extremely patient, and despite being a very serious person, he had a great sense of fun. You can see him calling targets to me and asking me to “go for double tap.” With the EOTech sight and the easy to manage recoil, it was child’s play. Then he let me rip of a few bursts on full auto. It looks a little wild, but in reality I just hauled the gun where I wanted the bullets to hit and the empty 5lb propane bottle died spectacularly in a hail of bullets. You can see how fun it was. I can’t thank Reuven enough for his patience. I stand by what I said in the last post. If I win the lottery, I’m going to buy 10,000 rounds of .45ACP and have Reuven teach me how to make this gun dance and sing. What you can’t see in this video is the fact that the person using my Droid to record the action is the Kriss Arms Vice President of Sales and Marketing, Christophe Guignard. In addition, he heads up the group that is working on making a suppressor for the Vector that is hearing safe while dry. The current can is only truly hearing safe when fired wet. The thing is I can actually buy the semi-auto only version. It’s expensive, especially when you include a suppressor. Then the Feds want $200 each for the NFA tax stamps. But I’m saving my pennies. I am inaugurating the “Buy a Kriss Vector” fund. If you look to the right side of my blog, I have added a PayPal button. Do you have too much money laying around? Hit the button and you will know that your money is going to a good cause. I had a fabulous time at the LuckyGunner blogger shoot this weekend in Knoxville. Breda, of The Breda Fallacy, was unable to come to the event. She teasingly asked me to shoot up some of the free ammo for her. I thought that this was the perfect gun for the World’s Most Dangerous Librarian. In all seriousness, this gun, the Kriss Vector, is the rifle I want for home defense. 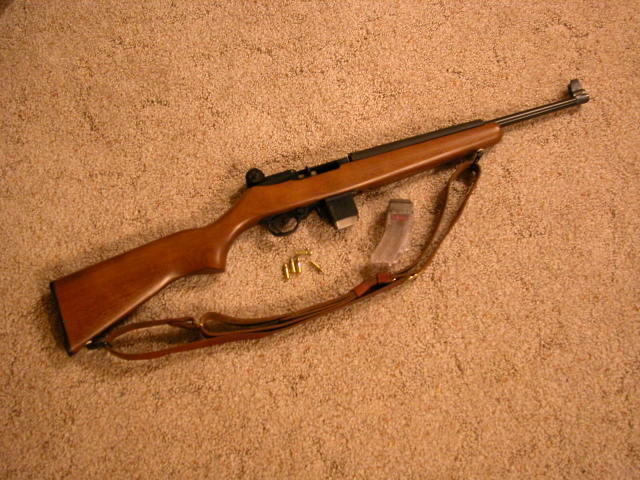 It is a .45ACP caliber short barreled rifle, and it has a suppressor attached. Due to the stupidity of US law, I will have to beg permission from the feds to own this, and pay them $200 each for the privilege of having a shoulder fired weapon with a short barrel and for the suppressor. But what a home defense gun it would be! 30 rounds of God’s Own Caliber on tap, without ripping my eardrums out. Pull the trigger as fast and as often as necessary, and you will hit what you are aiming at. That metallic ting sound you hear when I am shooting is actually the sound of the bullets hitting a metal 5 lb propane can (empty, of course) about 10 yards away. With the EOTech sight, you basically can’t miss. The recoil is straight back, with no muzzle rise. You could hand this to a 12 year old and she’d be ripping ragged holes in her target in less than 100 rounds. Before I shot this, I had the Kriss Vector classified as a “Lottery” gun. That is, if I won the lottery, I’d buy one. Now this gun is on my “must buy” list. In its place on the “Lottery” list is 10,000 rounds of .45ACP and about a week on the range with Reuven, the Kriss representative who showed me how to use it.